To create a Glue and Bead Sun Catcher you will need a clear plastic lid with a rim. Beads---(my collection since I was a child! ), sequins, or anything else you want! Take the white glue and pour it in to the top of the lid so it sits nicely in without running out. Don't fill it all the way to the top! Leave some room for the beads, but enough for them to sink in halfway or so. Now, drop the beads and sequins in to the glue. This was the FUN part! This could be done very randomly or placed very carefully in a mandala design. If you are not sure what a mandala or radial design is click on the link and it will show you some examples. Older children could make a much more detailed design by starting in the middle and branching out to the edge of the lid. 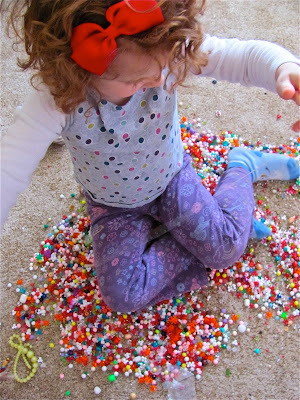 Cassie LOVED this part----choosing precious beads! Don't put out quite as many beads as me!! 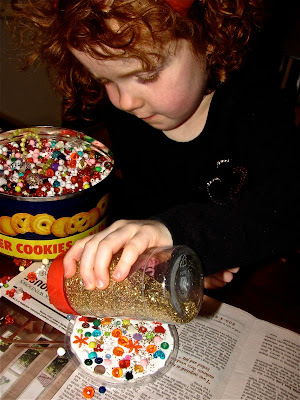 At least Cassie already had a day to explore these beads---it was a sensory bin in a tin! 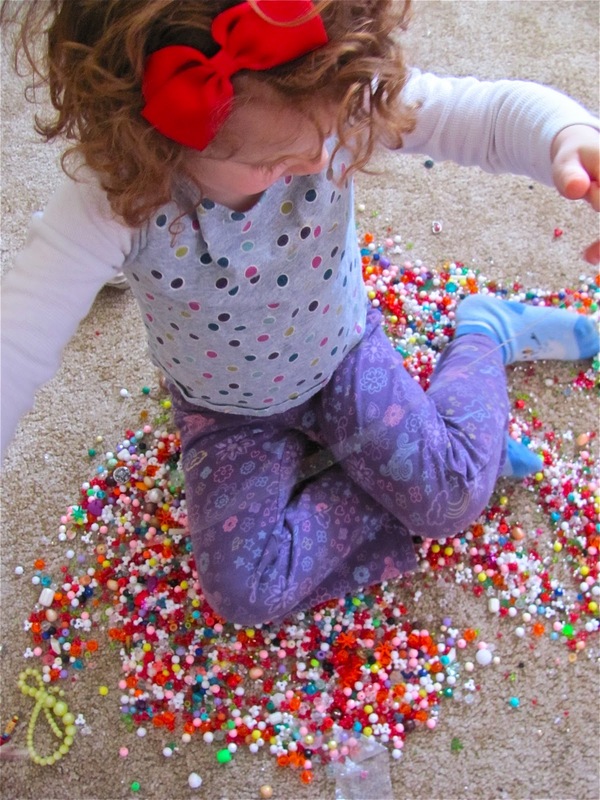 We tried stringing beads before I let her explore them, but she was more interested in just looking at the beads and feeling them! Adding some glitter for a finishing touch! 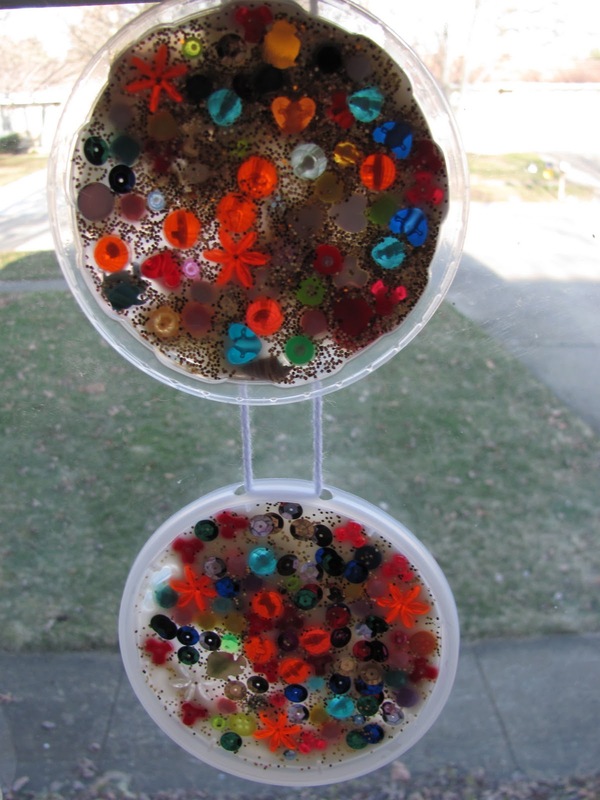 Here are our finished Glue and Bead Sun Catchers again. I just punched two holes on the edge of the lid and attached a piece of yarn for hanging. What else could you add besides beads, sequins, and glitter ??? I like this suncatcher! But a week to dry?! 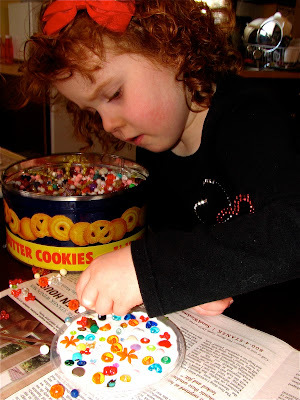 I don't have the patience - my preschooler would... but not me.. lol. I'll have to see if I have something clear to do this with. We have made these before and we added buttons! Yes---that is why I mentioned that it took a while to dry-----but like you said I had a more difficult time waiting! I kept checking on them! My daughter had FUN making them and kind of forgot about them until I brought them out when they were dry! They look cool! lovely project, we made some last summer with the same technique, but by first drawing on the lid with a black marker (simple summer imagery) and then filling in the shapes with beads. A nice compliment to yours! Here's the link to the 2nd of two posts we did about this project, and thanks for sharing on Craft Schooling Sunday! Another great idea! Thank you so much for linking with the Resource Centre. Hope you will be a regular visitor! This is awesome..I can't believe you have such an awesome collection of bling from when you were a kid! awesome! Beautiful! And I am impressed by the number of all the beads! I would also do another sun catcher with flowers and the leaves-a spring one. Adorable. My son and daughter will love these! Oh wow! These turned out GREAT! I love them! Great fun! Fantastic!! Thanks for linking up to Marvelously Messy....be sure to stop in next Monday for another party!! These would make terrific Christmas ornaments! Thanks for linking up to It's Playtime! So cute! I bet it was magical for your toddler! I love this idea! so cool. 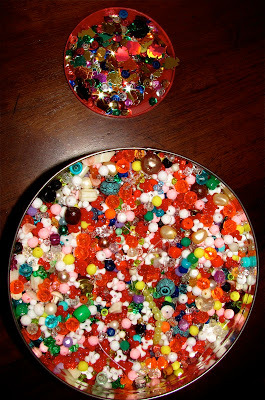 I wonder if you let her place the beads and glitter down on the lid without putting glue down at first and then you put tons of hot glue over it.....if maybe that would dry faster. you would need a lot of hot glue but it might look cool, other than that it's awesome!!!!! Brilliant!! I think my Ella would love this! Oh, what a great project for the kids. I know my kids would love this... with the beads and sparkles, how could you not?! I like the Christmas ornament idea. Maybe find a colored lid that is smaller (bread crumbs, oatmeal) and then dye the glue with food coloring (don't know if that would work)...red would be great...and then fill with red, green, and gold beads sequins. I would have never thought to use the clear, plastic lids for sun catchers. Fabulous idea!! I know my daughter will love doing this. I got to start saving clear lids. Thanks for sharing the idea with me on my blog. Such a unique idea! It turned out gorgeous and not to forget - your beads collection is oh-so-fun! We have many clear plastic lids saved from the 'take-aways'. Can't wait to try something like this or a twist on this..!